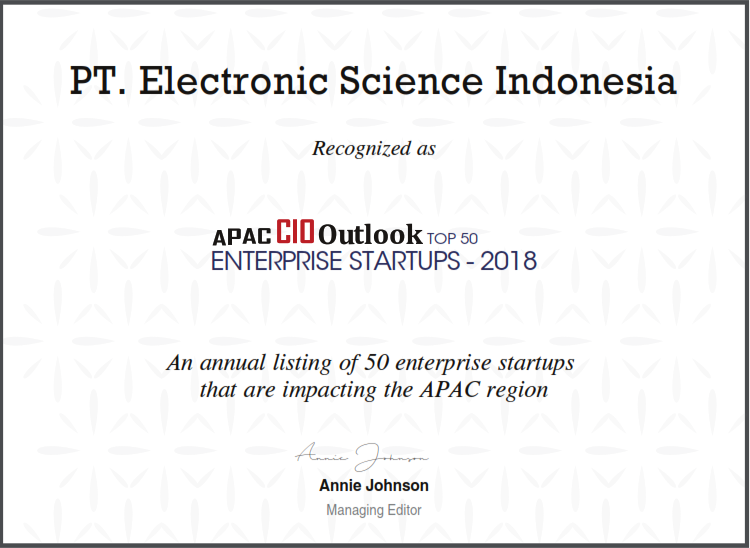 APAC CIOOutlook Magazine recognized eScience Indonesia lead by CEO Erick Hadi to be in the Top 50 Enterprise Startups of 2018 for developing “cutting edge solutions to enterprises in the Asia Pacific Region” and being one of the top emerging companies. eScience Indonesia was the only company in Indonesia who made it to the list. The mobile solutions of eScience Corporation has been continuously innovating the field process of enterprises in the Philippines, and has now reached Indonesia. Currently used by over 10,000 consistent active users, automating 60+ business operations, and making each field process more productive, more efficient and much better. eScience Indonesia started in 2016 and has now been automating the field operations of various Indonesian companies through mobile applications developed by eScience. PocketWiSE Retai is the leading eScience product used in the Indonesian market. This mobile app has been used by a famous apparel retail and distribution company with branches on malls and department stores.